Medical data is exploding in volume. Pharmacists at some 7,800 CVS drugstores across the U.S. will soon be able to tap IBM's Watson cognitive computing system in the hopes of predicting customers' health problems before they arise. That's thanks to a new partnership announced Thursday by IBM and CVS Health that aims to use predictive analytics and Watson cognitive computing to improve care management for those with chronic diseases. More specifically, the effort will involve the use of Watson's natural language processing capabilities to help healthcare practitioners gain insight from a mix of sources including medical records, pharmacy and medical claims information, mobile apps and fitness devices and then make suggestions based on that information. The jointly developed technology will be optimized for use across a range of chronic conditions -- hypertension, heart disease, diabetes, asthma and obesity, for example -- and will include the ability to identify individuals at risk for declining health, with an eye toward getting them involved in proactive programs, the companies said. The technology will also focus on encouraging patients to adhere to prescribed medicines and health regimens, and will be able to suggest primary-care and out-patient providers that could be able to help. The overall goal is to empower CVS pharmacists and healthcare providers "to better individualize, customize and 'nudge' patients towards their best possible health," explained Kyu Rhee, IBM's chief health officer, in a blog post. The system will be made available to insurers and other entities serving the employer and health-plan market, including also CVS's nearly 1,000 walk-in MinuteClinics. The companies didn't say when they expect the system to be ready. 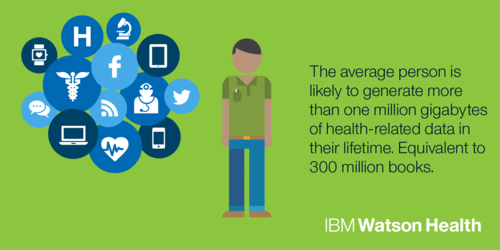 IBM's Watson is used in healthcare, financial services, retail and education. Earlier this year, the company launched its Watson Health business unit offering cloud-based access to Watson for use on healthcare data.